It is important for animals with disabilities requiring a custom brace or orthodox to have it fit properly. Without a properly fitted device, abnormal joint motion and gait compensation strategies develop in addition to pressure sores. We have the resources and contacts for local animal orthotic and prosthetic fabrication and can help with fittings for outsourced braces. Our preferred Veterinary Orthodic company is OrthoPets. Please visit their website for more details or contact us directly though e-mail. In order to determine if your pet's condition is suitable for an orthotic, we perform a comprehensive functional (movement) assessment. A veterinarian who is familiar with your pet's condition must be involved for a prescription of the device. It is best to drop your pet off for a few hours in the hospital where Kristen primarily works for an impression molding. During this process, we carefully mold a thin layer of cast material on your pet's affected leg. Most impressions require the pet to be standing during this process, so your pet does not need to be sedated. We try to make the process fun by offering treats and lots of praise. If you think your pet may have difficulty standing for an extended period of time, please let us know; we can make this process more comfortable by providing extra support. Once the impression is created, we take specific images of your pet next to the impression along with specific images of them walking and standing. All of these images are sent to your pet's case manager at OrthoPets. 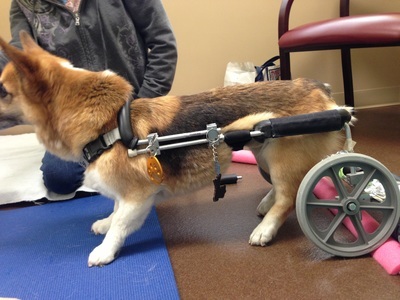 The hospital will take care of sending all the paperwork, video documentation and impression of the limb to OrthoPets. If you would like to be included on e-mail correspondence with OrthoPets, please let us know and provide us with your email address. After OrthoPets receives the impression, they will provide us with the cost to create the brace. Custom orthodics can range between $600-900 depending on the complexity and your pets diagnosis. Once OrthoPets receives payment and other medical information from the hospital they begin brace fabrication and can give a better estimate of device cost. This process usually takes about 5-7 days to complete, but rush services are available at an additional cost. The brace is shipped via FedEx 2 Day Ground. Overall, expect 2 weeks total time for fabrication and shipping. Once the device is received at the hospital a 45 minute appointment is required to discuss proper care of the device and a customized wear schedule for your pet to accommodate your daily schedule. We will take additional images and videos and send them to your pet's case manager at OrthoPets for final review. We will demonstrate how to properly place the brace onto your pet and make sure that you are comfortable placing the device on your pet. Before you leave, we will make an appointment for you in 2 weeks to follow up on how your pet is adjusting to the brace. A follow-up appointment should be made two weeks after you receive the brace. At this time, we need to assess how your pet is adjusting to wearing it and ensure it still fits properly. Ideally, we would also begin weekly physical rehabilitation at this time, which may include gait training in the underwater treadmill or specific therapeutic exercises. These appointments are typically 45-60 minutes, depending on the amount of rehabilitation and exercises are desired. 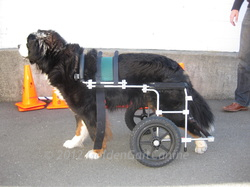 Making the decision to place a beloved family member into a mobility cart is a difficult one and requires some gentle guidance from experienced users. We are prepared to help your client step by step through the process of mobility cart selection and measurement, adjustments, introduction into the home and pet, and monitoring the success of the cart.